Silken Windhounds are not commonly known dogs in this neck of the woods. I had never heard of them, either, when my good friend the canine cardiologist at the vet school here on the Palouse recommended them to me as a good choice for my situation after my golden retriever died in 2009. A dog that can literally run like the wind might seem like a poor choice for a woman like me who doesn’t even walk all that fast, let alone run very often. But my friend was right. Silkens are loyal, calm, intelligent, patient, content to be attached to one human, and once old enough, happy to lounge on the couch most of the day. Compared to the behavior of most dogs, they can seem aloof. They don’t chase after balls, or slobber all over, or do much wiggling and jiggling and panting and barking. Instead, Romeo will lift his head off the couch and perk up one ear–which I affectionately call his “periscope” –if he hears a sound that merits his interest. If it doesn’t warrant his full attention, he flops his head back down and continues luxuriating in his spot on the couch. If it’s a car of someone he knows and likes coming to visit (like my veterinarian friend), then he’ll get up and canter to the door, both ears perked up now, waiting to say hello. His way of saying hello is a deep “greeting stretch”–the perfect and orignal downward dog pose. The doctor said the same thing, and wrote a letter to the effect that I walked faster and my balance was better when I walked with Romeo. I carried this letter with me wherever I went in case someone wanted to know. At the co-op, the manager said she was fine with it, as long as he wore a vest. So my canine cardiologist friend helped me order one. I have learned a lot in the last few years about what it means and doesn’t mean to have a service dog. I have worked with a service dog trainer who’s told me Romeo could pass muster in an airport he’s so good at attending to me. I have also learned that there is no official certification by law for training service animals, and that there are only two questions anyone can legally ask me when I enter a public space with Romeo. They are, “Do you have a disability?” And “Is your dog trained to assist you with it?” The answer to both of these questions is yes. Legally no further explanations are required. Naturally, though, I get asked a lot of questions about Romeo because he is such a handsome, clearly loving and unusual dog. 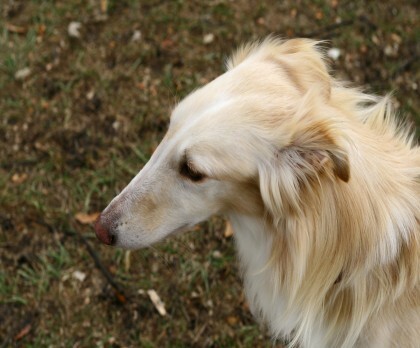 “Is that a Saluki?” is perhaps the most common one. Sometimes people even slow down in their cars and ask me. They also ask me some pretty interesting questions about myself. “Are you blind?” two wide eyed women in the mall wanted to know. I was looking right at them, but of course I answered politely, with a smile, that no, I was not. This still makes me giggle. Being different, whether it is because of how you look, or the way you eat, or think, or the animal that walks with you, or whatever it is, can be a challenge. But it also has a profound beauty and power, beyond any nervousness about being different. Romeo has taught me so much about this that I’d like to share an experience I had with him the summer after he came to live with me. I hope it helps you have eyes for the beauty in the way we are all different from one another in our healing process, and in what that looks like for each of us, and also how to recognize the beauty in the differences of those we spend our days with, even if they do not do what we do, and we think they should. A few evenings ago we were over at the first ball field on the edge of Gormley Park and the young woman I had seen throwing the ball for her big brown dog and little black dog came into the field from the dirt path. . .we were close enough to encounter one another. Her dogs were unleashed. We exchanged a few pleasant words and she said her little black dog was not very well socialized, but the brown one, Allistair, was very nice. And she offered to leave. I said oh no, not necessary, we’ll walk west and then around the field and just go home, which was what were going to do anyway. As we walked away I let Romeo off the leash just past the bleachers, the bike and foot path along the creek to our left, and Allistair came bounding up with a ball, asking me to throw it, but his real reason was to investigate Romeo. Romeo stiffened a little, but did okay with the smelling. Then he got frisky after Allistair did, but not in the same way: he ran instead. He ran into the field and then out again and back over the path and stopped at the cyclone fence along the creek, just looking at us all. And he came back when I called him. Then he ran again, a big figure eight in the field, and back out to the path, where he could see all of us. And I realized, he is playing. This is how he plays, and the other dogs don’t play this way, they can’t run fast enough with him, they think he is running away from them. And in a way he is, but I also saw this is HIS way of inviting them to play, rather than dropping a ball, or frisking or play rough housing and jumping, which he doesn’t like. It was so poignant and beautiful, to see him running, as an invitation, and yet to know his very excellence and grace in it leaves the other dogs behind. They aren’t bred or trained to recognize he is not running from them, or that he runs for pleasure, and not just out of fear. And I identified with his wanting to play in a way that others don’t recognize, that is beautiful, yet strange to them, and so in a way a source of puzzlement, isolation, or even aggression. (As in this dog must be prey?) Often I want to “play” but as an intelligent person others don’t understand how I am doing that, as it does not involve competing or besting or threats, however fake. Yesterday when I heard that there might be a new ordinance in Moscow requiring dogs to be vaccinated for rabies, I looked for the contract or anything his former owner might have sent me on the computer that would give me the dates Romeo had been vaccinated. This morning I was closing one e-mail and saw her remarks about his behavior and one of the things she wrote about playing was “he has some friends he runs with.” Bingo. Confirmation. Running is playing for him. His friskiness makes a wide arc across a field, or a figure 8 (usually around me). He is like a figure skater, almost. The other dogs don’t get it. But it’s okay, too, because he is expressing this more and more, and the other night was relatively happy with all of it, as he got in his own response to the encounter. And this is what he was doing with Linda’s two dogs as well. I thought it was the vibe of these particular dogs, but it may be just as much his expression of playfulness. And he’s doing it with them now, not only with me, as he first did long ago late last Fall. Lovely. Romeo’s 8 1/2 now. He’s doing just fine, but he doesn’t run like he used to when he first came to me nearly 4 years ago. Last year he was running full tilt in an old baseball field and suddenly yelped and went down. I thought he had stepped on something sharp, but when I went to examine the shaking foot, I found nothing. Within minutes, he seemed fine, got up on his own, and we walked back home. But he hasn’t attempted that full out gallop since. He knows it’s better for him to canter, lope, or maybe sprint, but not race. My canine cardiologist friend says it’s likely a bit of arthritis or stiffness from an old injury we may not know about that flairs up momentarily at some points of impact, since no tests or exams show anything seriously wrong. He’s an excellent example for me about remembering to pace myself. He just knows how, and doesn’t have to talk himself into it. As Shakespeare writes, “So Romeo would, were he not Romeo called, retain that dear perfection which he owns without that title.” Dear perfection indeed. The luscious residual effects of my entrainment to him, and his to me, are motivation to keep eating this way. Each deepens the positive effects of the other. I savor every moment I’m given to be his human. this is a lovely, just lovely story about how Romeo acts, runs, and is so good for you. I love my dog too, Maxie, a rescue Yorkie mix. thanks so much for sharing with us! You’re welcome, carollynne, so glad you enjoyed it. All best to you and Maxie! When my wife first described Silkens to me, my reaction was “why would you want a dog like that? It doesn’t do anything?” We’ve now had ours for over two years, and she is the greatest pet one could ever ask for! These dogs are total sweeties. Found you by way of Susan Voisin at FatFree Vegan Kitchen, and this is such a great post! My first dog Stetson (lab and Shepherd mix) had an incident like this but it involved trying to get up on the bed. I knew at that point that his life had entered a new phase, which was fine. He never again attempted to get up on the bed, and I put his doggy bed in my bedroom at night. If we are wise, we just go with the changes we are presented with (and pace ourselves, as you say)- that is what our companion animals do! Such a beautiful dog and a beautiful story. It really touched my heart. I have three pugs and they are quite different then Romeo but I do love them also. I would love to have a Silken one day!! Welcome, Diane! Thank you for reading and for this lovely comment. All best to you and your pugs!! Lovely writing. Thank you for sharing about this wonderful breed and your experiences with him. Keep writing. You have a talent. Maria, you must tell me! How do you manage to find the bigger-picture-wisdom in everyday things? And then wrap it all up in a beautifully written essay in which each sentence gives me a chance to feel like I have lived a fuller life? Romeo seems to have a personality to match his appearance, and I am so happy you are his human! I am sure he is so happy about that too! Oh Romeo! I talked to you for years in the Co-op and didn’t try to touch Romeo because he was a service dog and seemed like he wouldn’t appreciate it, but I remember the time when he showed me he recognized me as a friend by a very subtle step towards me and stretching his neck so his nose touched my hand. I about cried I was so ecstatic. You are both so special.